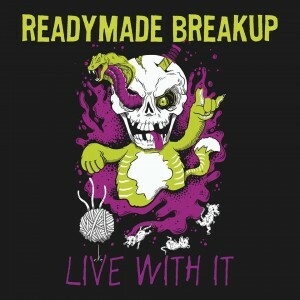 Readymade Breakup’s third album – their self-titled release from 2011 – was, at the time of release, their best to date. It was still a little hit and miss but the good material far outweighed the bad, while the band’s newly found tougher sound was clearly a step in the right direction. Time passed. A follow up never came and the band seemed to lose the momentum built up by the release. Their drummer moved away; their bassist, Mr. Gay Elvis, put out his own EP in 2014 and with an ever expanding gap between the present and their last release, by the end of 2015, it seemed Readymade Breakup were done. …And then, just as summer 2016 was threatening to hit, their drummer came back. It was only a flying visit, but it was long enough to convince Elvis and his musical comrades that there was only one thing to do: hit the studio. The results, recorded live to tape in one day, greeted the unsuspecting world as the ‘Live With It’ EP. It’s unclear whether the title is a sly reference to the material’s general rough edges (ie: it is what it is and we should, indeed, live with it) or whether it’s a pun on the fact that everything was recorded live in the studio. Whatever, it’s off-the-cuff nature and fuss-free approach means that it’s so often a world away from anything RB have given us before. The best track hands down, ‘Whiskey & Jellybeans’ is a full tilt garage rocker, powered by a relentless buzz saw rhythm guitar. Most of its melody is presented in a sing-along vocal – where a dumb lyric, in part, recounts the colours of the titular beans – but there’s also a superb bassline at work throughout. The combination of the raucous and surprisingly intricate is enough to carry the whole tune and while it often sounds like an outtake from The Replacements‘ ‘Hootenanny’ sessions, it also represents 1:50’s worth of highly enjoyable fun. Working a similar Replacements-eque blueprint, ‘Low Life Creep’ rattles along with a sneer, as rock ‘n’ roll vocals collide with the sounds of a garage rock combo in a fairly unrestrained way. This time, however, the focus shifts a little further towards the rhythm section, resulting in a louder drum dominating the track. It doesn’t quite scale the heights of ‘Jellybeans’, but it has a genuine sense of high spiritedness that only comes from this kind of off-the-cuff recording. Granted, these tracks don’t always sound so much like the Readymade Breakup of old, but then, like a musical hit and run, it’s a clear snapshot of a moment in time; a moment when musical friends re-connected and felt the need to share their enjoyment of music with the world. You might like it…you might not. Live with it. This entry was posted in Album & EP Reviews and tagged alternative, garage, gay elvis, punk, readymade breakup by Real Gone. Bookmark the permalink.